ion builds a full line of both rackmount and pedestal servers covering a broad range of requirements. All of ion's servers are custom-built and tested for each customer but every one starts with an Intel® ServerBoard for unmatched quality and reliability.. Every server passes diagnostic testing and configuration validation before it leaves the integration center. Each server includes documantation of exactly what was in it and how it was functioning. Let ion help you design the right server for your needs, now and through the life of your server. The ion Server Blog explains much of the engineering that goes into ion's server products. 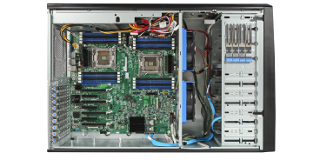 The ion Advantage delivers affordable servers that are better tested and better supported. Now save 5% on any server you configure. ion's pedestal servers are designed to balance quality, perfromance and value. These servers feature 1 or 2 Intel® Xeon® processors, 32GB - 512GB RAM, 4 - 16 drives in an Intel ServerBoard® and Intel® server chassis with a wide choice of I/O options and server management capabilities. ion designs and builds a range of 1U and 2U rackmount servers and compute nodes based on Intel® server platforms - ServerBoard and chassis - with 1 or 2 Intel® Xeon® processors. Each supports a wide choice of I/O options and server management capabilities. The scope of these servers is broad: 4 - 44 processor cores, 32GB - 1536GB RAM, 4 - 24+ drives. ion has extensive experience building storage servers and storage appliances for corporate, academic and governmental customers as well as several developers of storage virtualization solutions. Starting with Intel® Xeon® processors in an Intel® ServerBoard, ion's PS StorageServers can be optimized to meet almost any storage need. Does your organization need physical servers whose function and content are already redundant? Perhaps a small, quiet and low power ion NUC8 miniServer. 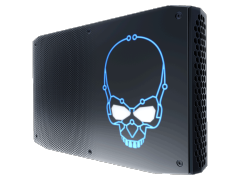 Learn more about ion NUC8 miniSERVER.